Dogs are active pets. They need to go out on daily walks and need constant affection and attention. But as your beloved pet ages, they can lose the mental sharpness they had as a puppy. The only way to maintain their intellect is by giving them toys that make them think. Fortunately, there are 17 toys that are available that are designed to enhance your dog ’s mind while offering a fun experience. Don’t hesitate, keep reading to find out which toys are best for your pooch! What’s more fun than having your dogs chase squirrels in the park? Having them chase squirrels at home of course! The Outward Hound Hide-A-Squirrel Puzzle Plush Squeaking Toys comes available in four sizes from small to extra- large, making it a fun puzzle for pups and adult dogs. Stuff the squirrels inside of the holes and watch your dog find out how to remove them. Once all of the squirrels have been removed, they have an internal squeaker, making them fun attention-grabbing chew toys for your pet to play with. If any of the squirrels become damaged, there are replacement parts that are available. To keep the fun going, stuff the squirrels inside the logs again. Bound to become your canine friend’s favorite, this toy is designed with an amazing array of shapes, textures, and sounds so you can keep having fun with your furry friend. The Hide-A-Squirrel Puzzle is the top of our list because of its versatility. It can be used for a game of fetch or for a fun game of hide and seek. You can use this toy indoors and outdoors, as it will still keep your pet mentally engaged while its in use. Due to the toy’s interactive nature, it’s a great boredom-buster for when your dog is home alone and it doesn’t make a lot of noise so that it is too distracting. Thus, making it a great toy for owners who want to help their dogs reduce their anxiety. When we play video games or apps, there are difficulty levels to choose from. The same should go for our pets! This flip board consists of 6 puzzle pieces designed for small dogs to play with. To use it, simply open up the puzzle pieces and place the treats underneath. The reason why it is for the intermediate dog is because it incorporates multiple techniques for them to find the treats underneath. For instance, the disks move from side to side, the lids have to be flipped open, and the cones can only be removed by lifting them up. This requires your pup to know what action goes with each shape. For the budget conscious dog owner, you can’t go wrong with the Trixie Products Flip Board. It’s priced under $10 while still providing hours of fun and mental stimulation for your pet. Once they’ve gotten used to the puzzle, they will be rewarded with tasty treats! By getting this puzzle piece, you’ll find it easier to teach your pet how to solve problems on their own. Thus, making it a great tool for owners trying to teach younger pups how to think for themselves. Calling all smart pups! The Nina Ottoson Dog Brick Treat Puzzle Dog Toy is designed for your little troublemaker, giving them the mental stimulation and fun they need. It ranks at about level 2 difficulty, so dogs with more experience will excel with this toy. It consists of 3 different feeding features with removable bone pieces and simply open and close compartments. We can imagine how much slobber is on your toys while your pet tries their hardest to obtain the treats. This toy requires only soap and water to clean, taking only 5 minutes of maintenance before it can be reused. This puzzle was designed to withstand the roughness of your dog. Created out of sturdy plastic, many users stated that it could take a beating from your frustrated dog. Thus, making it a great toy for long term usage. You can fill the toy with small dog treats or kibbles. When your dog pushes the ball with his paws or nose, the food rolls out and will occasionally fall out of the top. If your dog loves to eat, this toy will keep him occupied and entertained until all of the food is gone. For smarter dogs, you can increase the toy’s difficulty level. The device has an interior disc that can be turned to make a larger or smaller opening. The smaller the opening, the harder it will be for your dog to shake a treat out of the ball. Our favorite thing about this treat dispensing dog toy is that it comes apart for cleaning. You can easily hand wash it with dish soap and warm water or wipe it out with a damp cloth. It's highly reusable and durable enough to withstand your small dog's teeth. Next on our list is the Spot Ethical Pet Seek-A-Treat Bone Toy Puzzle. If you want a simple challenge that will keep your dog entertained for a few minutes a day, you should consider this toy. It’s easy and quick to set up, with small cups for treats, which are covered with circular sliders. Your dog can move sliders around to find more treats. This is good for the first few minutes after being placed in a crate when you’re on your way out the door. It’s made of eco-friendly, sturdy wood, making it a durable toy for your pet to play with. We like this puzzle because it can help train your pets to both problem solve and be more patient via observation skills for rewards. It also has 3 sizes so you will have something appropriate for your doggie no matter their build. By getting this toy, you’ll help your dog become more intelligent and better at solving puzzles and thus more likely to learn more complex tricks. In order to get the treat, your dog has to move the sliding part then take the cover off. If they do this in the incorrect order, the treats won’t be accessible. This requires mental concentration on your pet’s part. This toy offers a great way for you to enjoy an interactive and fun game with your dog. It features ‘bricks’ that covers the treats that are easy enough for your dog to discover the treats hidden inside of the puzzle. For those who are worried about choking hazards from pieces that might come off, you don't have to worry. This puzzle is sturdy with no loose parts and can be used for larger dogs. Being on a high end of the level 2 difficulty puzzles, this toy will be a challenge for your pup. It's not just a simple movement that's associated with a shape or flap; it's also about the order. If you have a highly intelligent dog, give this puzzle a try! Who says learning can’t be fun? The Nina Ottosson Dog Tornado Treat Puzzle Dog Toy, you can stimulate your dog’s brain and have fun at the same time! The interactive and unique toy has four rotating discs which can be adjusted to your pup’s level. There are compartments where the treats are hidden underneath the toy’s layers. Your dog has to rotate the layers in different directions with their paw or nose to unlock the treats. You can increase the level of difficulty by placing the white blocks inside the compartments. Your pet will love the reward of a job well done, and you will love watching him put on his puppy thinking cap! We like how the toy provides a challenge for your dog. While they might not get it on the first try, they will get used to it after a few hours of tampering with the puzzle. Think about getting this toy if you want to keep your dog both happy and healthy. Nose work and sniffing are one of the most important mental activities for a growing puppy, and the SNiFFiz SmellyMatty Dog Snuffle Mat is one of the most challenging and interesting toys to have for developing their skillset/senses. The mat has five soft treat dispensing toys made of Oxford fabric and can withstand some serious tug and play form your dog. The toys can be arranged in different pockets, making your dog work harder to find the rewards. Each snack has a different challenge for your pet to access the treats. Both small and large dogs will love the SmellyMatty Dog Snuffle Mat. Also, the mat is advertised to be machine washed. However, we recommend that using the gentle wash setting for cold water and hand drying it to achieve the best results. Keep your energetic pup at bay with the Nina Ottosson Dog Smart Dog Puzzle Toy Dog Game. Your dog will have to look for treats by moving one block to another in different circles. It’s a simple game, but it will challenge your dog throughout the process to understand how the materials move in which order. This can be a good segue into getting them to understand tricks like opening the door to go fetch the morning paper. You can increase the difficulty by locking the blocks with bone-shaped pegs. Your dog will learn how to unplug the blocks by lifting up the pegs one by one to move the blocks containing the treats. 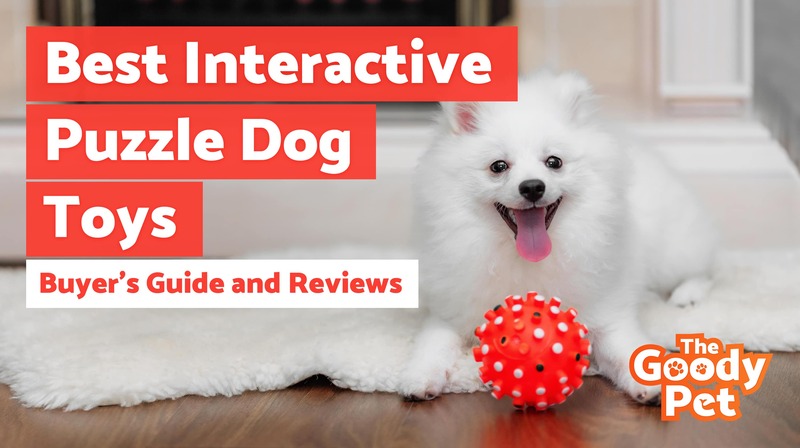 You can enhance your relationship with your dog with this interactive and fun game. Since it’s a level 1 game, you can help prepare your pup for more challenging puzzles. It helps reduce your dog’s destructive behavior and help stimulate their mind. The Zippy Paws Woodland Friends Burrow is a toy for puppies and adult dogs alike. It features a burrow and 3 small chipmunks. It's both an interactive and squeaky tool, making it easier for your dog to be entertained. You’ll have a lot of fun playing hide and seek with your dog. To interact with the puzzle, let your dogs grab the squirrels from inside the log. Once your dog finds and removes all the squirrels, you can place them back inside the log, which allows them to become mentally stimulated! So think about your pooch when shopping for this toy! We like that its a simple, yet effective way to entertain your dog. Due to its plush material, its soft and won’t damage your dog’s teeth. Try out this toy if you want an easy puzzle to help your dog become better at problem-solving! Channel your dog's intelligent and playful side with the Trixie Pet Products Mad Scientist for Dog Toy. Designed for intermediate dogs, this toy works by placing the treats inside the three beakers and covering the lid with holes. The treats will be released once your dog knows how to flip the beakers and keep them balanced upside down - a fun challenge he will be happy to take on. There are two sets of lids you can adjust for varying levels of difficulty, and its non-slip rubber feet keeps the game in place for your pet. The Trixie Mad Scientist is different from your average pet toys, presenting a fun and new way to challenge your dog's problem-solving abilities. It's increased difficulty will keep your dog challenged for some time and prevent them from becoming bored. We’ve all played Twister before, but what about a dog twister? This game features a wheel of 9 compartments that are filled with treats that are only revealed when your dog moves the blocks within the circle. One of Nina Ottoson’s most popular toys is the Twister Dog Puzzle, a challenging snack dispensing game. Your dog can push through the interlocking segments to find the treat, but you can lock the panels in place to increase the difficulty. We like the toy's increased difficulty. Since its a level 3 toy, it is designed to push your pet's intelligence to their limits. Once your dog gets used to it, they'll be rewarded tasty treats for their efforts! Ever played a fun game of tug of war with your dog? Well, now you can! The Tug-A-Jug Meal Dispensing Dog Toy has scent holes on the bottom to keep your dog interested in the toy. Because the toy is clear, your dog can see the treat hidden underneath for added incentive. When the Tug-A-Jug rolls, you’ll see the treats ratting enticingly. The rope and the rubber wrap act as chew-friendly toys. This toy works on all forms of small treats. In fact, you can use your dog’s regular food to entice them into playing with the toy! Washing is easy too! The body of the Tug-A-Jug is durable. Its constructed out of non-toxic materials, similar to the devices made for bulletproof glass. The base of the Bob-A-Lot Interactive Dog Toy is rounded, so there will be some movement especially on marble or hardwood floor. It's slightly noisier than other toys because of its plastic material build. It's a fun toy as it wobbles around, making it enticing for your dog to play with. You can adjust the difficulty level in two ways. First, it would be at the tab of the Bob-A-Lot’s opening. Second, you can adjust it during the treat’s exit. The large space inside is enough to fill an entire meal's worth (up to 2-3 cups of food). The Bob-A-Lot fulfills two of your pet's needs: exercise and mental stimulation. Even with rough play, your toys will stay in an upright position so your dog will feel excited to knock over the toy, but it won't ever happen making it a great distraction for tiring them out! This is a fun toy, even if you have larger dogs in your household. The Pupper Pamper Treat Dispensing Dogs Slow Feeder is designed to keep your pet entertained even when you’re not home. Your dog has to manually move the treat dispensers to receive the treats stored inside the toy. Simply add your dog's favorite treats to Pupper Pamper Interactive Dog Toy for when you want your dog to eat slowly or for playtime. To make sure that your dog doesn't get bored with the puzzle, users can adjust the difficulty to ensure that their pet is mentally stimulated. We like how the height can be adjusted to your dog’s size. The large Pupper Pamper is around 12 inches high with a 1.4 wide base. However, it can be lowered to 8 inches for medium sized dogs. So your dog won’t have any problems having fun with this toy! Playing Hide and Seek is a great way to get your pet mentally active. And the ZippyPaws Woodland Friends Burrow Hide and Seek Plush Dog Toy is perfect for them! Let your dog engage with their natural hunting instinct with this puzzle toy. The toy comes with 3 hedgehogs which can be replaced after your dog throws them out of the log. The toy's design makes it easier to offer a creative challenge for your dog. And each of the hedgehogs provided an interactive challenge, making your dog more involved and intrigued once they begin playing with the toy. So, try this toy to give your dogs hours of fun when you're not around. Squeaky toys are your dog’s best friend. And the ZippyPaws Woodland Friends Burrow has 3 hedgehogs with squeaky toys that will keep your pup engaged. Last on our list is the Zippypaws Zoo Friend Burrow. You simply place the 3 monkeys inside of the burrow and your pooch will spend hours digging them out of the dens! Based on its design, it’s a fun toy for both small and large sized dogs. And once your dog finds a toy, they can play with the toys individually as each of them come with a squeaker. While it can be noisy, know that the toy is helping your dog become smarter while providing a great source of entertainment. Plus, the added benefit is that as long as you can hear them playing with it, you know they’re not causing trouble elsewhere. This toy will pose a great challenge for your dog. Your pooch will be begging for you to place the monkeys back in the burrow once they’re removed. Confused on what to get for your pup? Look no further! We’ll show you what you need to look for in this quick buying guide. Why do owners pick puzzle toys for their dogs instead of chewy treats and squeaky toys? Here are some reasons why. Sniffing for dog food releases dopamine in your pet's brain. This hormone will make your dog feel happy and relaxed. Puzzle toys that release a scent are good at making your dog feel better, but any toy that engages their "seeking pathway" of their brain will do the trick! Helping your dog focus their energy on a puzzle toy can prevent them from turning to undesirable or destructive behaviors such as begging, nuisance barking, or chewing. Dogs want to stay busy and can become depressed or neurotic if they don't have opportunities to stimulate themselves. Imagine being stuck in a waiting room with a dead mobile phone or no magazine - you'll be bored stiff. Exercise is a great first step to utilize your pet’s pent up energy, but a smarter dog will be harder to please. Whether you want to help your dog release energy, present a challenge, or build their mental acuity, puzzle toys are a great option. Dogs need to be mentally stimulated, just like people do. Especially when your dog is home for hours at a time, it's important that your pets can occupy themselves without getting bored. You should always have the best puzzle toy that matches the age of your pet. A puppy that’s 3-4 weeks old will still have developing teeth, so the best toys are made out of soft rubber, or plush fabrics. At 3-9 months, your puppy will still be growing, but will show signs of teething. So make sure you steer clear from rugged rubber-like toys. However, at this age, your puppy chew toys should be used to distract them from eating shoes, furniture, or similar. After the teething period has passed, you will have a dog with a strong jaw and endless energy. This is a good time to introduce them to tennis balls, and rope pulls, and hard toys are now acceptable. Once your dog is age 7 or more, they no longer have the jaw strength or the teeth they had when they were a young, excitable dog. But it's still a good idea to invest in toys that keep them engaged. At this age, the toys should be softer for them to chew on. Luckily, there is an array of toys and puzzles that match your dog’s physical aspects and health of all ages. Match your dog’s chewing habits to the toy for an entertaining and fun experience. Even with the correct basic information, it can be hard to navigate the aisles of the pet store for the tough dog collars and the high-quality toys. Dogs come in different shapes and sizes, but the most engaging and fun ones are the best interactive dog toys. A toy that's fun for dogs of all ages is the tug-of-war toy that provides unlimited entertainment. The cotton ropes are good for younger puppies. With their teeth and gums still growing, the cotton rope is known for its ability to reduce pain while making sure that their teeth are kept healthy and clean. The flying toys that are thrown in the air are for highly active dogs that are constantly jumping and running. This toy also floats in water, so it creates further entertainment for dogs that like to get wet. Be sure to let your pooch wear a life jacket to prevent any unfortunate mishaps! Other options include sensory dog toys that can improve your dog’s senses. Stingy multi-colored rings and bones are a great way to attract your dog’s attention. One everyday favorite is interactive toys that provide physical and mental stimulation, while helping to control your pet’s unhealthy habits, such as gulping. For helping your dog grow intellectually you can give them interactive dog toys and give them time to start adapting. Dogs have more incentive when their owner takes an active interest in the toy as well, which helps foster faster development. If you are going to buy toys for home, make sure they are made of soft fabric (plush, cotton, etc.) so that it doesn't damage the furniture of your home. In addition to toys that can be played at home, don't forget there is a myriad of fun toys that can be used outdoors as well. A great outdoor toy that's fun for exercise is Frisbee. This is the golden standard used as a cliche in most dog movies as an intriguing and fun game to interact with your dog and help keep them in shape. Dogs always love to play catch and return games. Also, it's important to keep the outside and indoor dog toys separately. Playing outside means that the toys will often attract dirt, making them a hazard to clean floors on home. Also, some of the plastic or soft toys aren't designed for outside usage. With plenty of toys and a dog collar, there are a lot of places to engage in fun play outside. With over 17 dog toys in this review, it’s virtually impossible to leave without a fun toy for your dog. Our recommendation? We suggest that you get the Outward Hound Hide-A-Squirrel Puzzle Plush Squeaking Toys. This toy gets our top pick because of its versatility, durability, and because it's just fun for your dog! With over 6 squirrels, your dog won't have any issues staying occupied! If the squirrels come loose, it's designed for owners to quickly add them back for more puppy fun! No matter which toy you get, you’ll have a lot of fun keeping your dog entertained. Regardless if they are newborn puppies or senior dogs, they’ll have a blast once you bring one of these toys home.